Sponsored by Teva Branded Pharmaceutical Products, R&D Inc.
Pride-HD is a Phase II clinical research study of an investigational drug called pridopidine in people who have a diagnosis of HD. The purpose of this randomized, double blind study is to see what effect the investigational drug, pridopidine, has on movement, thinking, and behavior, compared to placebo, in people with HD after receiving either pridopidine or placebo. In addition, information will be collected about safety and tolerability of pridopidine in people with HD. This study is not currently recruiting participants. If you have any questions as a past participant, please connect with the clinical trial site directly. This is a multicentre, multinational, randomized, parallel-group, double-blind, placebo-controlled, does range finding study to compare the efficacy and safety of different doses of pridopidine versus placebo in the treatment of motor impairment in Huntington disease (HD). 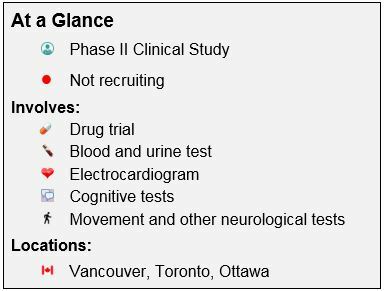 For more detailed information on this study and others and for the most recent updates, please go to clinicaltrials.gov ClinicalTrials.gov is a registry and results database of publicly and privately supported clinical studies of human participants conducted around the world.